"I spent just $10 per week, on average, or 85 percent less than before." I’m typically a saver, not a spender. I often walk or bike the three miles to work to save money on public transportation because, you know, $2 each way adds up. But I do have a spending weakness, and it had gotten out of hand: Between October and November 2017, I realized I’d spent about $520 eating out. Often, this came down to pure laziness. I rarely hit up Trader Joe’s, and, since I hate packing my lunch, made excuses to avoid it. Like needing to catch up on my Bravo shows instead. By late November, I realized my reluctance to prepare food at home was preventing me from putting as much money as I wanted to toward my student loans and savings account—both top goals. So I gave myself a challenge: For the first three weeks of December (right up until I started holiday travel), I wouldn’t eat out at all. Here’s how I did it, and what I learned. 1. I inventoried my entire kitchen. Because I hadn’t done a big grocery haul lately, I figured my kitchen was empty. But you know what I found after going through my fridge, freezer and cabinets? So much food. Most of it would’ve been just fine if I’d continued to ignore its existence. (Dry spaghetti lasts a few years!) But the broccoli would’ve sprouted mold, and the kale and romaine were just a few days from turning brown—so this exercise saved me from wasting what I’d already purchased. 2. I planned my meals. Luckily, I was able to squeeze breakfast, lunch, dinner and snack options for the first five weekdays from what I already had, and plan meals with leftovers. For example, I made a quiche with the eggs (and shared it with my fiancé Chris), and cooked extra dinner portions for the next day’s lunch. I was truly surprised at how many different meals you can whip up with the same ingredients. Meal-planning also highlighted what I didn’t have, so I could be very intentional about what to buy. At the store, we were smart shoppers—only spending about $45 per week on groceries instead of our typical $58 average. We bought grains in bulk, scouted sales (once, we got 20 chicken legs for $14!) and avoided pre-packaged stuff. 3. I allowed two small exclusions. Okay, this is where I’ll admit I didn’t actually avoid restaurant food entirely. Before committing to the challenge, I’d already scheduled two get-togethers: dinner and drinks with my friend Taylor and a lunch for my co-worker’s birthday. I didn’t want to back out—or sit there staring at them while they ate—so I allowed myself a $15 budget for each. That’d still require some effort. Taylor and I meet up regularly, and my bill is usually closer to $30. The Verdict: A little effort goes a long way. Thanks to sharing a few plates with Taylor, and picking a cheap, fast-casual restaurant for the birthday celebration, I stuck to my social budget of $30—and successfully avoided eating out otherwise. That means I spent just $10 per week, on average, or 85 percent less than before. Surprisingly, it wasn’t even that hard to plan for weekends. Fortunately, my December weekends were fairly free, so I had time to make meals from scratch. If I’d had something on the books, I would’ve dedicated more time to packing food or considered giving myself another small budget. 1. Some wiggle room is a must. Honestly, I’ll never stop eating out entirely. But the trick to not going overboard is better planning. Setting my $15 budget ahead of time made me more mindful of my spending, and that sense of control was really empowering. 2. Accountability buddies are key. Chris played a huge role in my success by helping me plan meals and stick to my shopping list. (I tend to default to filling the cart with whatever looks good at the time.) And it was actually Taylor’s idea to share some bruschetta and flatbread to keep my bill under $15. (I ended up eating enough to feel full and still had a great time, but spent half of what I usually do!) Without their help, sticking to my budget would have been a lot tougher. 3. Advance planning saves you time. 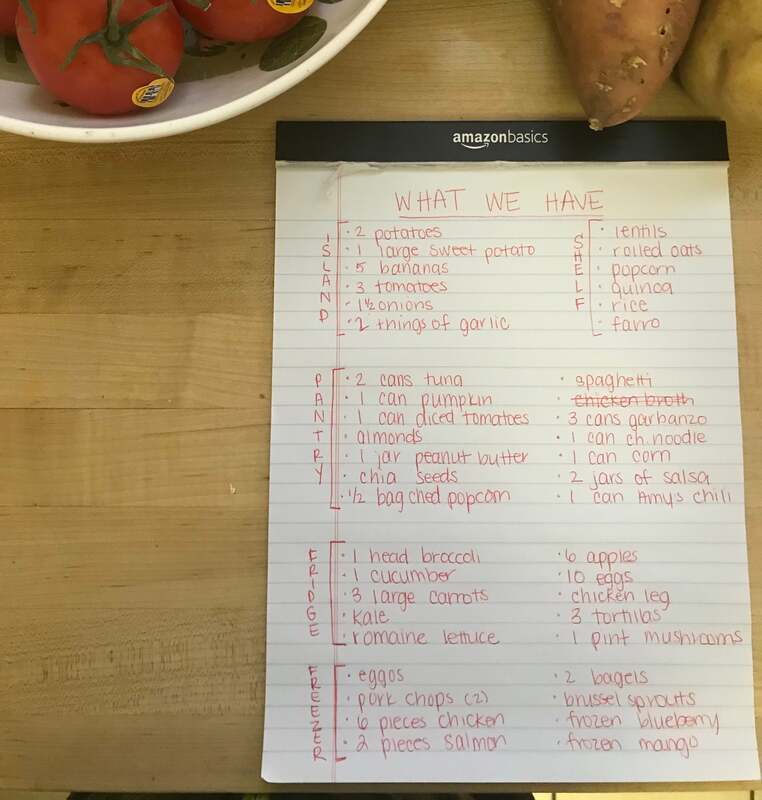 I generally resist meal planning and writing out a grocery list because it feels so tedious; I always think I could be doing something more productive. But this challenge helped me realize that these exercises are actually the key to saving both money and time. Knowing exactly what I had at home and what I’d be eating during the week meant I didn’t need to make last-minute trips to the store, buy something I already had or spend time agonizing over what to make for dinner—leaving me more time to watch Bravo, and marvel over my bigger bank balance.